Tasty and healthy! Please note that hand is mine, not Hand’s…she was still on vacation. Hi all! After an extended spring break, thyme travelers are ready for more adventures! This week’s recipe showcases one of the world’s oldest ingredients, the egg. Many of you recently celebrated Passover and Easter, so you are probably familiar with eggs, and perhaps even sick of them for the foreseeable future. People have been eating eggs since the beginning of time-ostrich, quail, chicken, you name it. Eggs became so important in many cultures that they took on symbolic meanings of fertility, renewal, rebirth, and so on, many of which are still relevant today. Ever wonder why eggs are associated with Easter? As it turns out, eggs were not historically permitted during Lent, the month leading up to Easter. So on Easter Sunday, people went all out by cooking and coloring hard-boiled eggs, and incorporating eggs into rich breads and cakes. Some of these baked goods still prepared today include the Greek lambropsomo, Russian kulich and choerek, French echauds oeufs de Paques, and the Italian colomba. Jews serve eggs at life cycle events, especially at Shiva (a period of mourning) to represent the circle of life (I have long argued that The Lion King pretty much sums up Jewish beliefs in a nutshell). And the Jewish holiday of Passover would not be possible without eggs. Honestly, what Jewish women have been able to achieve using eggs as the primary leavening agent is nothing short of magic. My sister and I made our mom’s sponge cake for Passover. 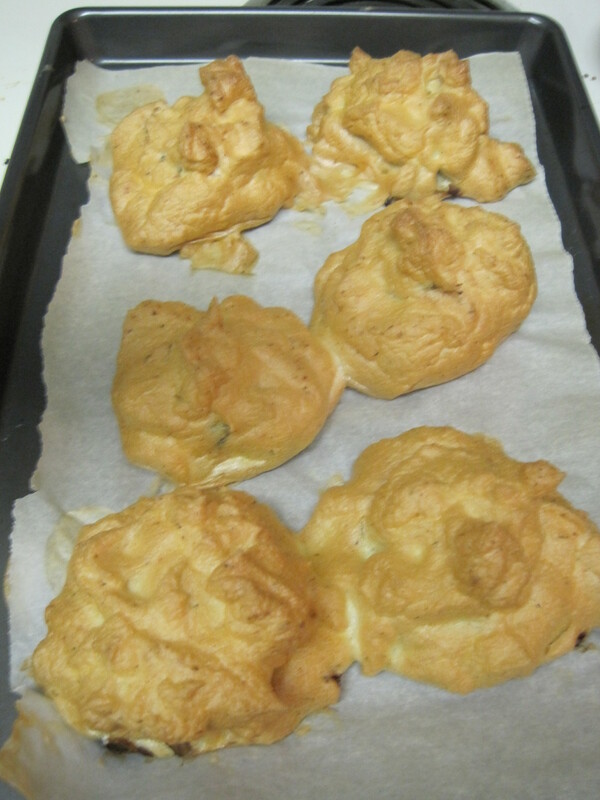 Twelve eggs, no flour, and still looked good after spending flight in suitcase! Magical indeed. In the United States today, chicken eggs are by far the most popular and easiest accessible. While early colonists raised chickens and gathered their eggs, it was not until the mid-1800s that scientists became interested in breeding chickens for specific tasks, including egg-laying. In 1879, Lyman Byce and Isaac Dias of Petaluma, California developed the first egg incubator, which sped up the hatching process by replacing hens sitting on eggs all day with machinery. Incubators were only the beginning. Over the decades that followed, inventions like trap nests (kept hens laying eggs in compartment until their eggs could be identified), artificial lighting (to simulate the sun and thereby extend egg-laying hours), and conveyer belts to feed the hens and collect their eggs significantly increased egg production. Unfortunately, these inventions came at a price, and that debt had been shouldered by the hens. Inhumane treatment of the hens in overcrowded chicken coops has become widespread, and the public is taking notice. Many of today’s consumers elect to pay a bit more at the grocery store for cage-free eggs. Once viewed as a dangerous food causing high cholesterol, most doctors now consider eggs to be part of a balanced diet because they are rich in protein and other nutrients. They may be used in anything, from a thickening tool in ice cream to the base for a quiche. They come in many different sizes and may be dried, frozen, fresh, pasteurized, organic…the list goes on. Dried eggs were especially important during World War II, when they were sent overseas to troops and boosted America’s egg industry. Lowry, Thea. Empty Shells: The Story of Petaluma, America’s Chicken City. Novato, CA: Manifold, 2000. Gage, Fran. “Eggs.” In The Oxford Companion to American Food and Drink, ed. Andrew Smith, 206-7. New York, Oxford University Press, 2007. Sometimes when I can’t sleep at night or wake up really early, I start practicing new recipes. This was a pleasant early morning creation inspired by my sister’s egg white and splenda bites. 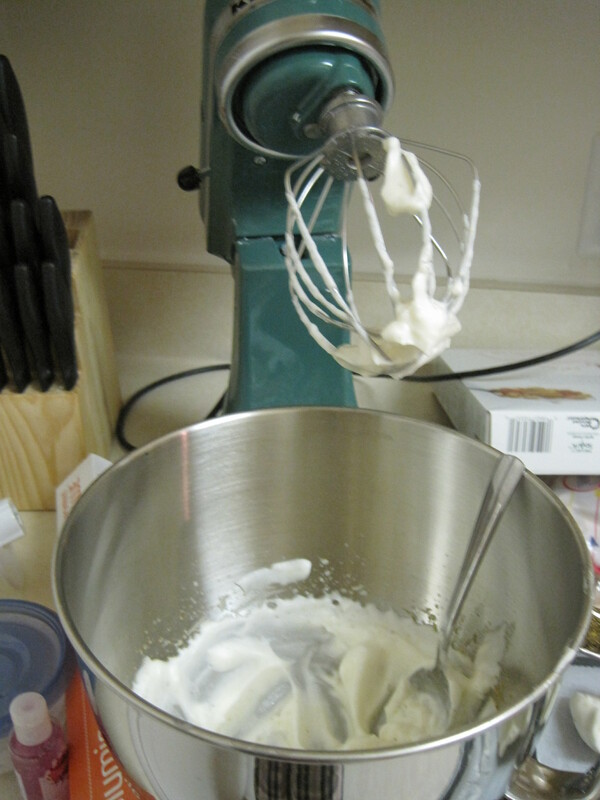 The success of the recipe is determined by how you whip your egg whites. Despite being one of the oldest and most commonly used ingredients, whipped egg whites are hard. If you use a plastic bowl instead of glass or metal, chemical residue from the plastic will affect the ability of egg whites to whip. You are going to use stiff egg whites for this recipe. Minerva the Mixer did a great job! 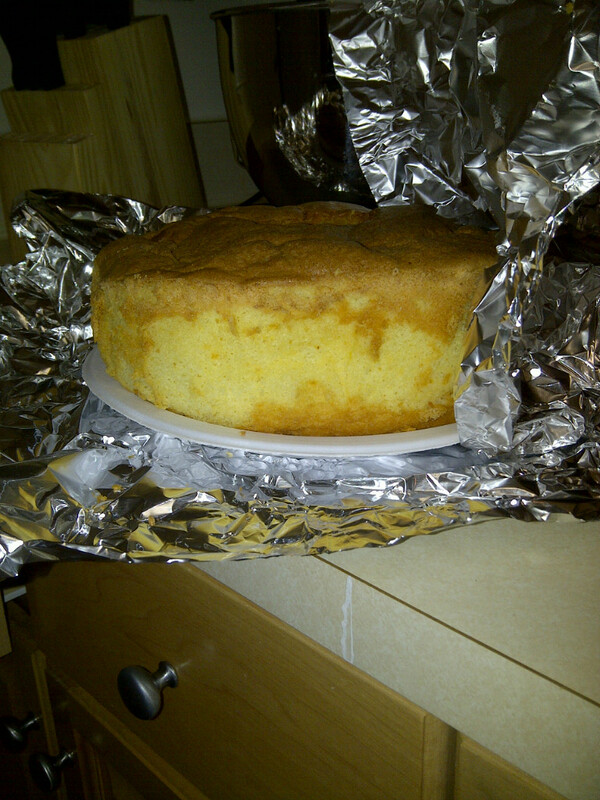 • Stiff peaks: When you remove the beater or fork from the mixture, hard and firm peaks form. NOTE: Yes, you can overbeat eggs. If you beat the egg whites for a long time and they get stiff and then liquidy again, throw out and start over. You are past the point of no return. Congrats! These are great for breakfast or as an appetizer. You can change up the filling too, and add a dipping sauce! 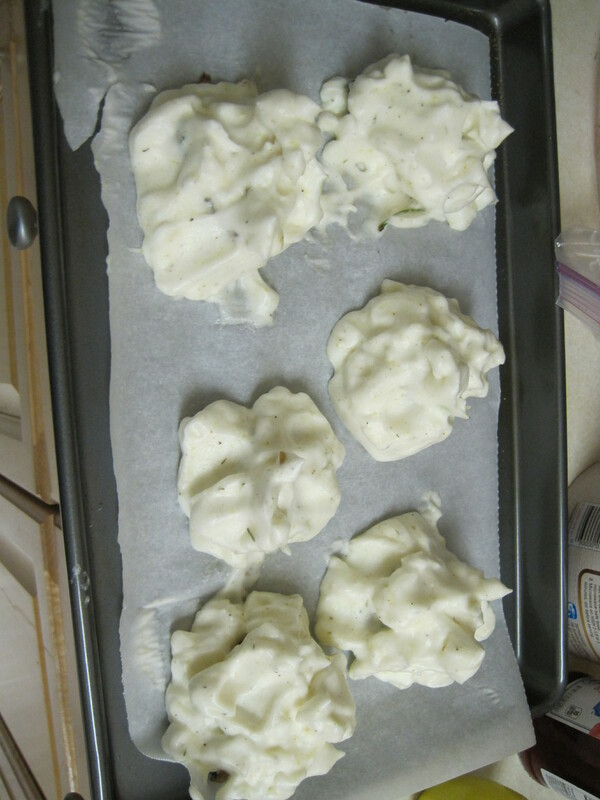 ½ cup (3) egg whites (I used pasteurized egg whites from carton since I had them on hand. If you go with this option, the lemon juice is especially important to helping promote stability. 1) In a medium skillet, sauté onions. 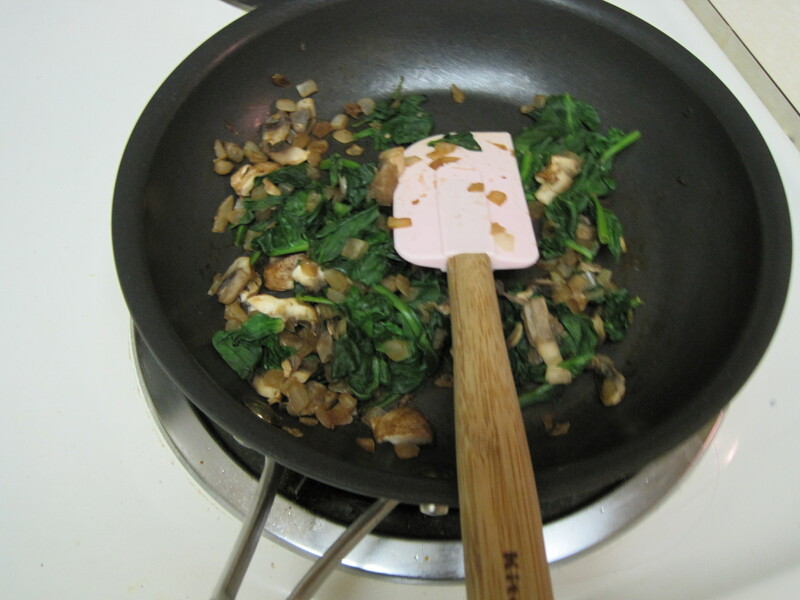 After onions turn light brown, add spinach and mushrooms. Set vegetables aside and allow to cool slightly (HINT:If veggies are watery, either cook out the moisture or drain with paper towel). You could really use any veggies you’d like. 2) Beat egg whites in a glass or metal bowl until soft mounds form. Add lemon juice. Continue to beat until firm peaks form, and add the spices just before stopping. I had to resist the urge to rub all over my face. Did you know that Queen Elizabeth I treated her face with egg whites and powdered egg shells to soften her skin and enhance complexion? 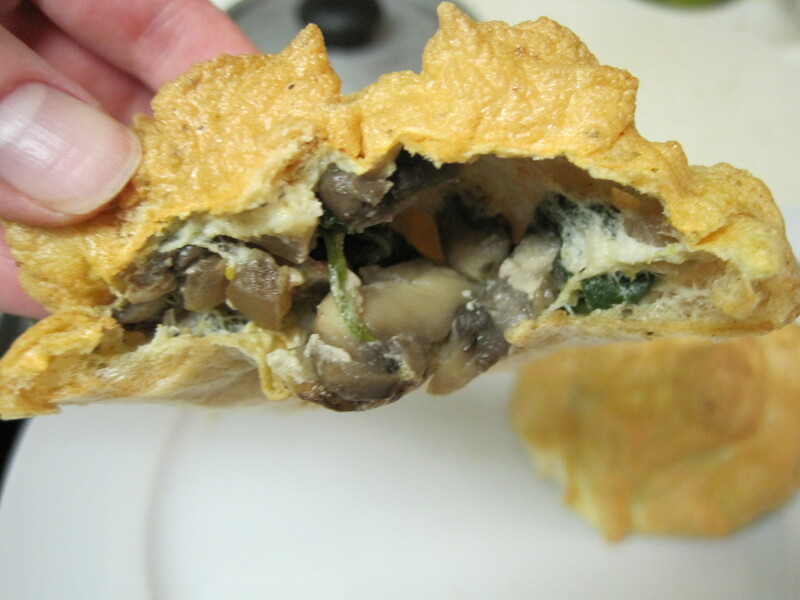 4) Fill indentations with veggie mixture, and cover with surrounding egg whites. 5) Bake in a 350 degree oven, or until outsides are toasted and crunchy. Enjoy! Bringing passion for history to all through delicious food. This entry was posted in Uncategorized and tagged appetizers, Dessert, eggs, food history, Healthy, History, mushrooms, spinach. Bookmark the permalink.